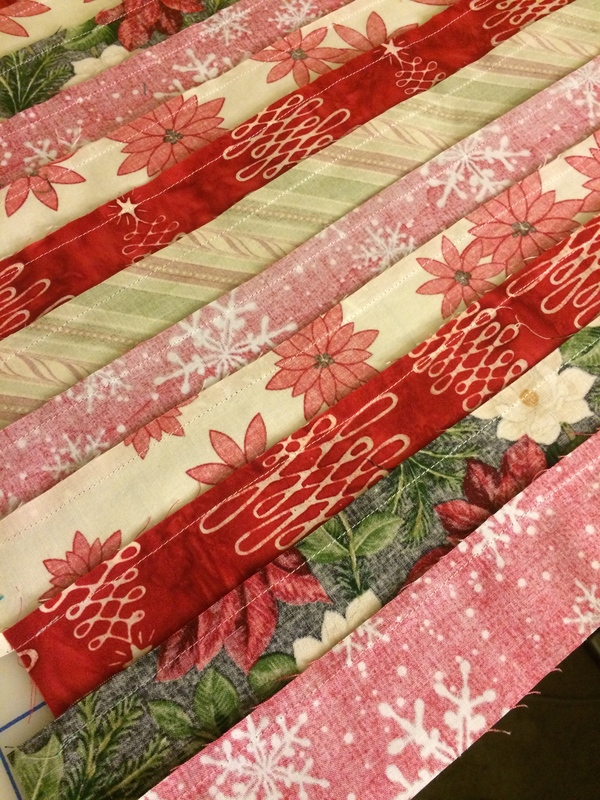 First, cut out strips of fabric for the strip-quilted front of the stocking. Mine were two inch strips. 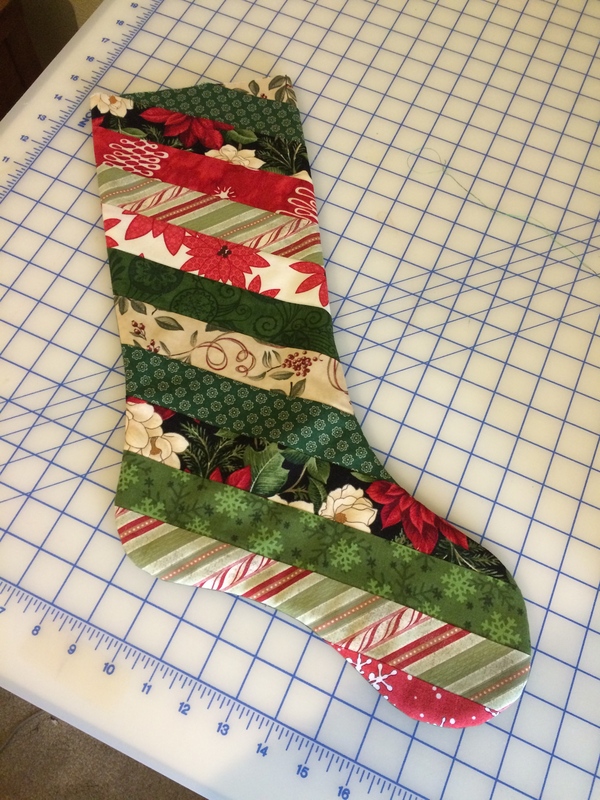 For my stocking pattern to fit, I needed 13 strips. 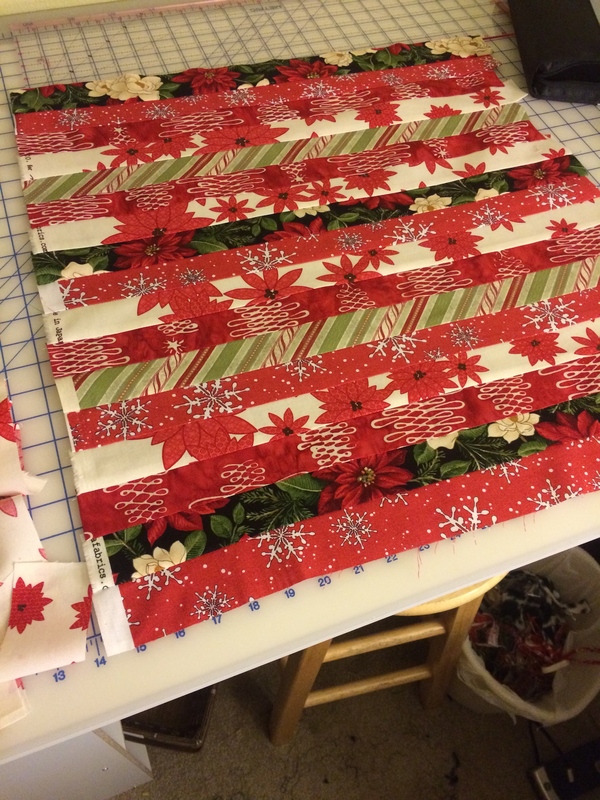 Lay out the strips and then sew together using a 1/4″ seam. Press the seam allowance one direction, just to make it easier to sew. 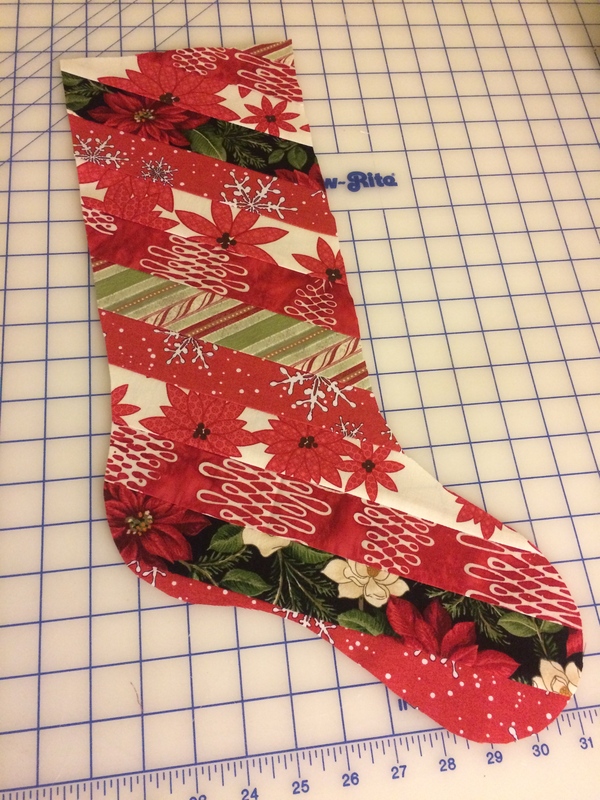 After you have enough strips for your stocking pattern to fit, cut out your stocking front. 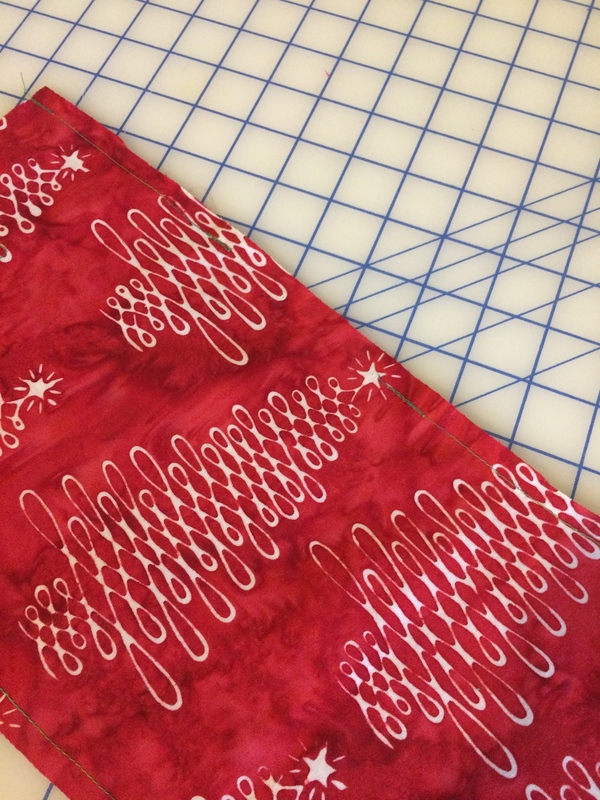 Remember to leave a 1/4″ seam allowance if your pattern doesn’t include it. 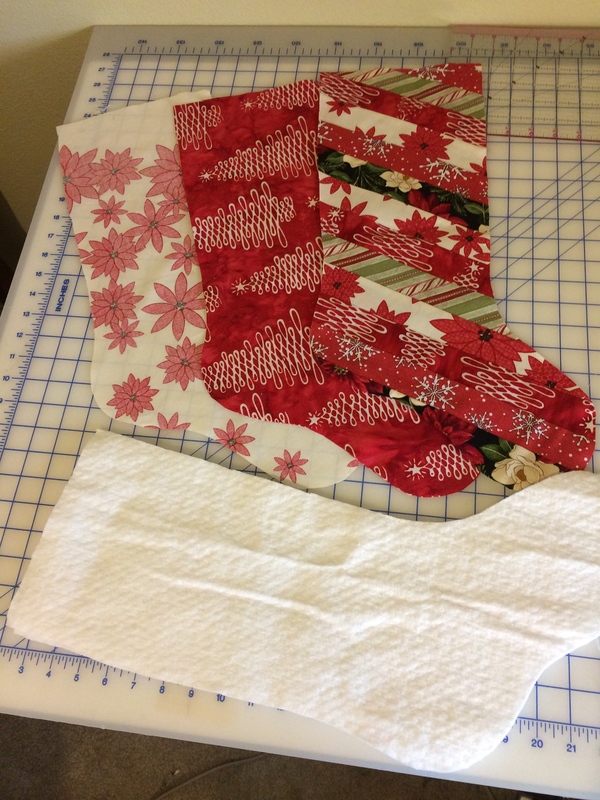 Cut out the remaining pieces for the stocking so that it can be assembled: 1 stocking back, 2 batting and 2 lining. 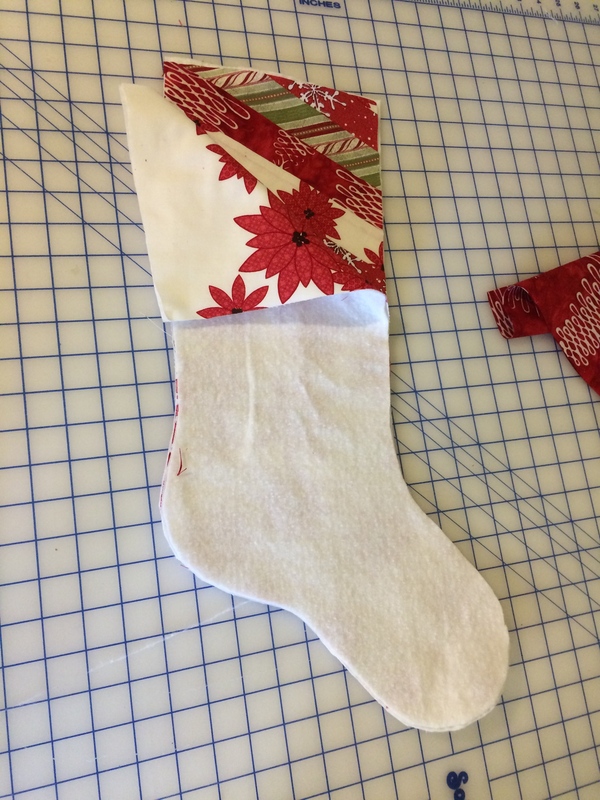 Arrange your “outside” stocking pieces so that they can be sewn together: 1 layer of batting, topped with the stocking back, topped with the stocking front (right sides together) and topped with the final layer of batting. Sew together using a 1/4″ seam. Trim/clip curves. Turn right side out and iron. Next, assemble the lining. 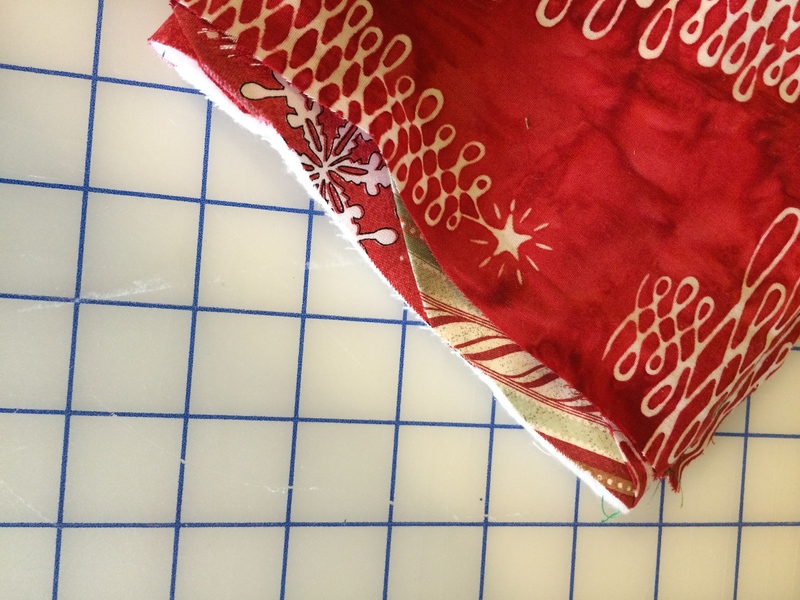 Place the lining pieces right sides together and sew using a 1/4″ seam allowance. 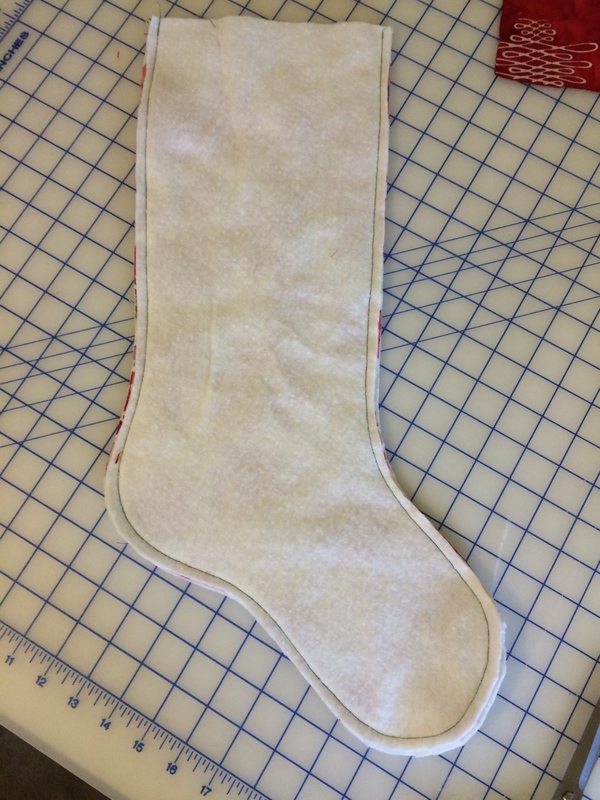 On one side of the stocking, leave a 3-5″ gap. Leave the lining as is, and do not turn right side out at this point. Stuff the outside of the stocking into the lining. Right sides should be together. Line up the top edges so that they can be sewn together. 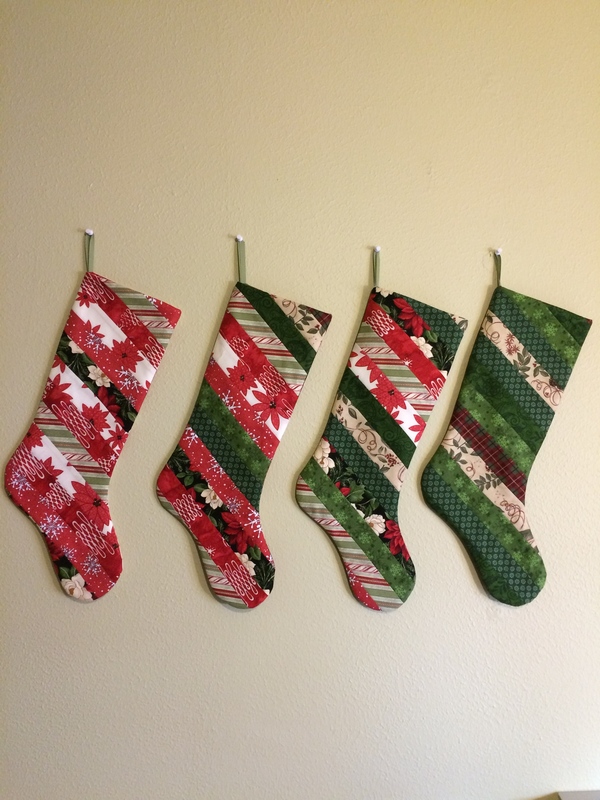 If you want to add a ribbon or bias tape to hang the stocking, do so now. The looped part will be placed between the lining and the quilted layer, with the loop pointed down and the ends of the loop into the seam. Match seams and pin into place. 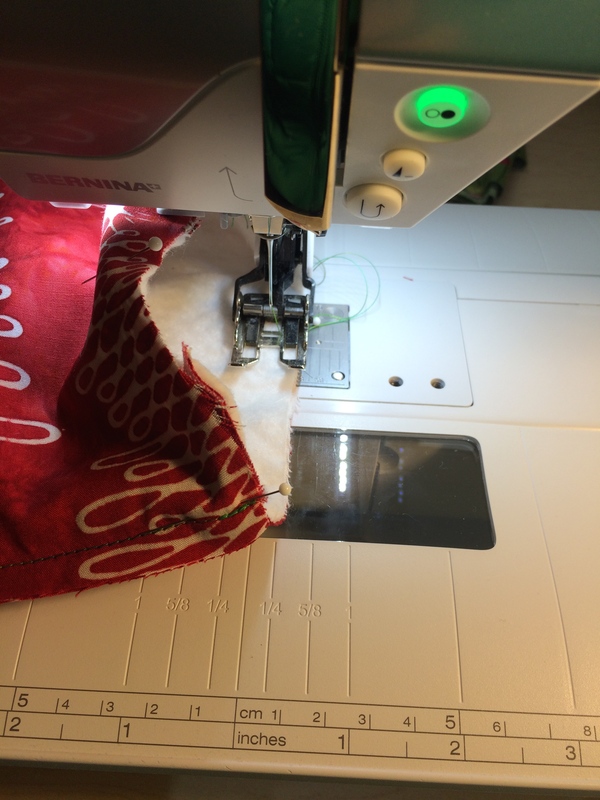 Sew around the edge, using a 1/4″ seam allowance. Reinforce seam where ribbon or bias tape hanger is located in the seam. Turn right side out using the gap that you left in the stocking lining. Hand sew the opening closed. 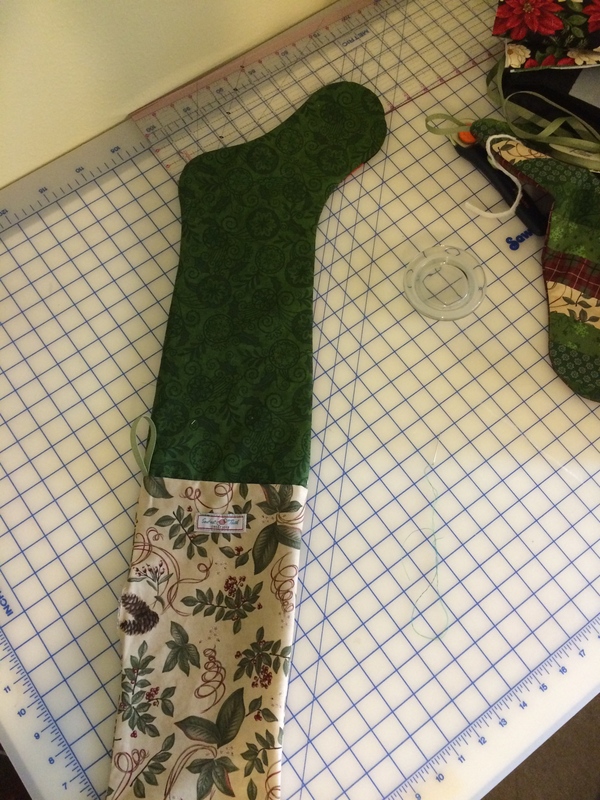 Iron the lining flat, and then insert into the “outside” of the stocking. Iron again, and you are done! Such a simple, but beautiful way to decorate for Christmas. And functional, too! A couple of notes: The outside could be more elaborate with quilted blocks or even an appliquéd design. 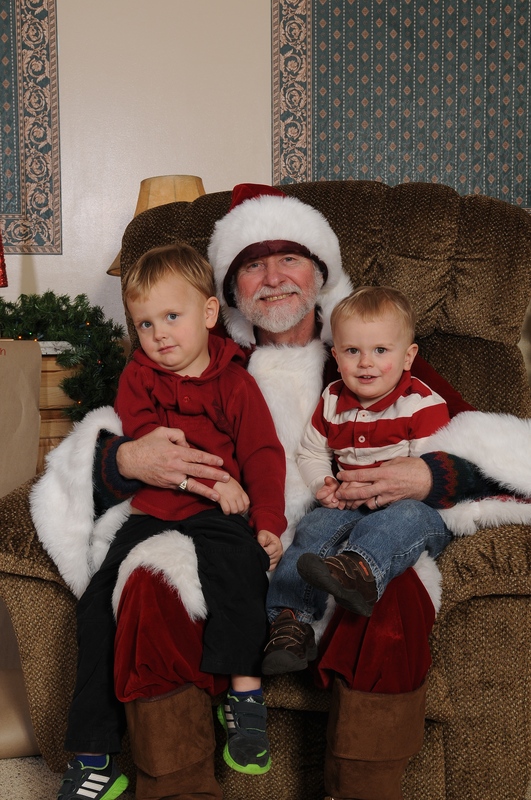 The assembly would still be the same after the front of the stocking was completed. I also added my label to the inside of the stocking, rather than drawing attention to it on the outside. I sewed it into place prior to assembling the lining. 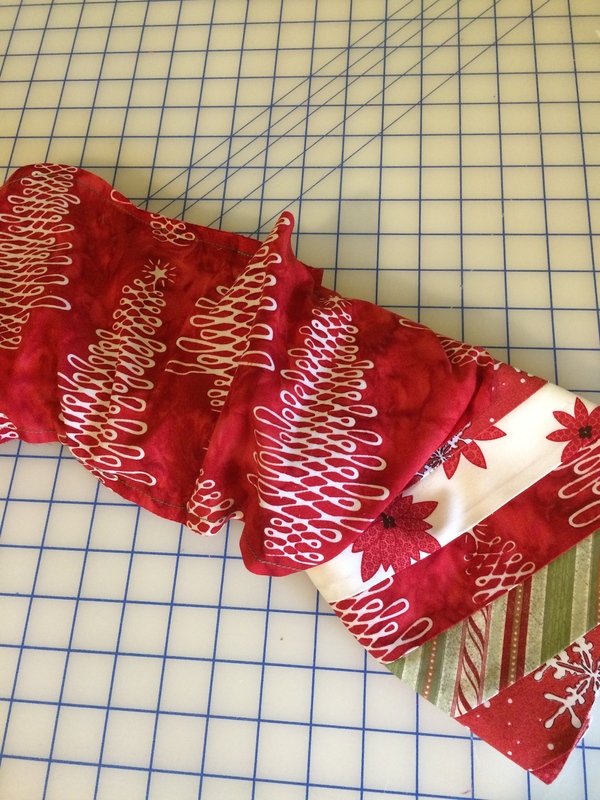 One could also add a secret pocket to the lining for money or other Christmas treasures. The sky’s the limit!